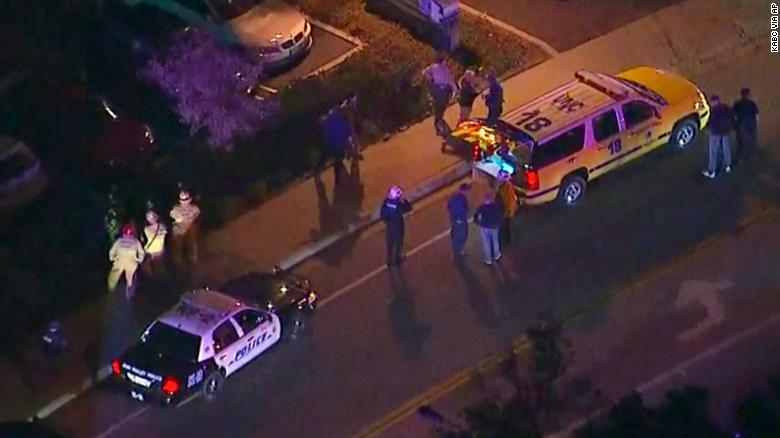 (CNN) A US Marines veteran opened fire at a Southern California bar late Wednesday, killing at least 12 before killing himself, and sending panicked survivors scrambling through doors and windows to escape, authorities said. Investigators believe Ian David Long, 28, used a Glock 21 .45-caliber handgun with an extended magazine to shoot patrons, staff and a sheriff&apos;s deputy at Borderline Bar & Grill in Thousand Oaks, and they&apos;re trying to figure out why he did it, Ventura County Sheriff Geoff Dean said Thursday morning. "It&apos;s a horrific scene in there," he said earlier. "There is blood everywhere and the suspect is part of that." Among those killed was Ventura County sheriff&apos;s Sgt. Ron Helus, who rushed in minutes after the first gunshots were reported at 11:20 p.m., Dean said. The shooting broke out during the Western-style bar&apos;s weekly line dancing and college night open to people 18 and older. People dropped to the floor and hid behind bar stools in stunned silence, witnesses said. Others jumped over chairs and broke windows to get out. About 21 others were sent to hospitals with injuries and released, the sheriff&apos;s office said. Many of the injured were not shot but were hurt trying to escape, Dean said. Authorities have yet to release the names of those who were killed or injured, and anxious friends and relatives gathered at a designated spot in the city to await word on what happened to their loved ones. The gunman apparently arrived at the bar Wednesday night in a car, and shot a security guard who was standing outside, Dean said. Long then stepped inside, and apparently shot other security workers and employees and opened fire further inside the club, the sheriff said. Witnesses described a man clothed in black and wearing glasses as he walked onto the dance floor filled with people. Von Molt, who&apos;d been dancing, ran toward the nearest exit but tripped, and people kept running on top of her in a rush to escape. Eventually she got up and ran out -- and got checked at a hospital for bruises. Von Molt said some of her friends got out, but she didn&apos;t immediately know where others were. "I started hearing these big pops. Pop, pop, pop, he said. "I look up -- the security guard is dead. Well, I don&apos;t want to say he was dead, but he was shot." People "dog-piled on top of each other" trying to hide in silence, California Lutheran University student Teylor Whittler told KABC. Some men ran toward them and said the gunman was coming. As they escaped through the bar&apos;s back door, she heard a second round of shots. The bar is near several universities, including California Lutheran, which canceled Thursday&apos;s classes in response to the shooting. Nearby Pepperdine University said it believes "multiple Pepperdine students" also were there. A prayer service for the campus community was scheduled at a theater there at noon Thursday. Deputies were at Long&apos;s home Thursday morning, seeking to serve a search warrant, Dean said. Helus, the slain sheriff&apos;s deputy, arrived at the bar 3 minutes after 911 calls came in, along with two California Highway Patrol officers, Dean said. "I don&apos;t think there&apos;s anything more heroic than what he did," a colleague, sheriff&apos;s Sgt. Eric Buschow, told CNN Thursday morning. "(He said), &apos;Hey, I have to handle a call. I love you, I&apos;ll talk to you later,&apos; " the sheriff said. His son, Cody, 22, was there with friends -- and while his friends got out, they didn&apos;t know where Cody was, he told CNN and HLN. The father told CNN he can track his son&apos;s cell phone -- and the tracking indicates it still was in the bar Thursday morning. "It&apos;s at the club. It&apos;s not moving. That&apos;s the problem," said Coffman, who was awaiting information at a center for relatives. "I am very emotional right now," he said. "This is my firstborn son and it&apos;s tough." The father said Cody&apos;s friends woke him up at 1 a.m. to tell him about the shooting. "I&apos;m afraid that Cody ran to the gunman instead of away from the gunman. That&apos;s the kind of boy Cody is," he said. CNN&apos;s Nicole Chavez, Keith Allen, Christina Maxouris, Shimon Prokupecz, Natalie Gallón and Gianluca Mezzofiore contributed to this report.